Go Big with these Extreme 3 inch blinds! 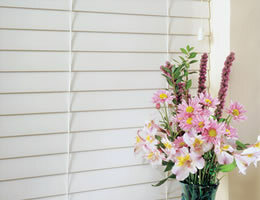 Our Extreme 3 inch Faux Wood Blinds offer the largest blind slat available. Designed with an elliptical slat for a tapered louver style look. Each of our 3 inch faux wood blinds come standard with a 3 1/4" faux wood crown valance and a trapezoid bottom rail. Offered with a cord tilt control for tighter closure.